The British Antarctic Survey has a problem in the form of an enormous crack in the East Antarctic ice sheet. Dormant for about 35 years, The Crack began to grow in 2012. Today, it threatens to cleave off the entire ice shelf supporting the Halley VI research station. And so, Halley VI is being towed out of harm’s way. “If [the crack] continues to move and the ice breaks off, the station would be on the wrong side of the crack,” Athena Dinar, a spokesperson for the British Antarctic Survey, told Gizmodo when asked why the meteorological station is being moved 14 miles (23 kilometers) inland. If The Crack is simply ignored, Halley VI could wind up adrift in the sea. Map showing the current location of Halley VI, its future location, and The Crack (chasm 1). 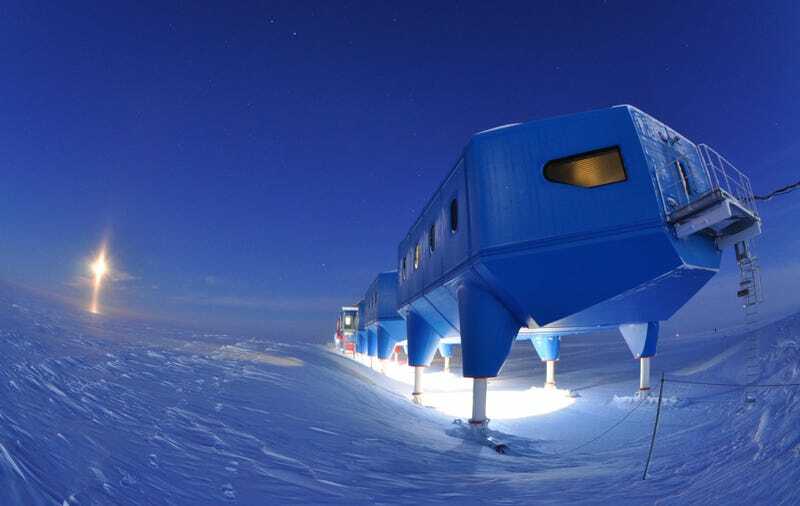 Installed in 2012 to study extreme space weather and ozone, Halley VI is located on the 150 meter-thick Brunt Ice Shelf, a dynamic region of the East Antarctic ice sheet that flows toward the sea at approximately 0.25 miles (0.4 km) per year. Here, and elsewhere along Antarctica’s margins, the slow migration of glaciers pushes ice shelves out over the open ocean, a bit like a diving board being unfurled over a swimming pool. Eventually, a buildup of stress causes these ice shelves break off and form icebergs, a process known as calving. Fortunately, the British Antarctic Survey was aware of the dangers of calving when it installed Halley VI; the latest in a long line of Antarctic research stations that led to the discovery of the ozone hole. Accordingly, Halley VI was designed to be mobile. Each of the station’s eight modules can be decoupled from its neighbors and towed across the ice on tractors, which is exactly what’s happening now that Antarctic is emerging from months of wintry darkness. The process of moving the station is expected to take three years. Unlike West Antarctica’s coastline, where ice is being lost at a more rapid clip due to climate change, the Brunt Ice Shelf has not experienced significant warming, and it has shown no signs of increased calving in recent years. The Crack, however menacing, appears to be perfectly natural.